Our East End getaway, provides a serene tropical escape. Inspiring, peace and relaxation, our beachfront resort is a perfect choice for small corporate events, retreats, as well as family gatherings and special celebrations. Ideal for small corporate meetings, team building programs and receptions, the Wyndham Reef Resort is the picture-perfect beachfront destination. 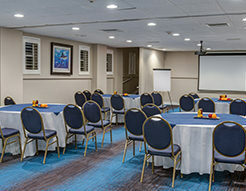 Our meeting space is well-appointed to accommodate up to 50 guests ensuring a successful event and that you and your special guests experience true Caymanian hospitality. 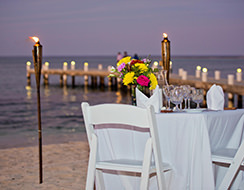 Our ocean-front resort is ideal for special birthdays, engagement and holiday celebrations. 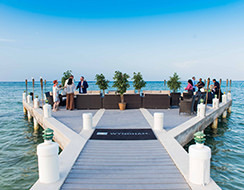 Wyndham Reef Resort on Grand Cayman’s picturesque East End is the perfect venue to let our expert team help you plan an exceptional event. Wyndham Reef Resort offers guests the perfect combination of work, play and relaxation in a beach-front setting. Spacious accommodations combined with an attentive staff will ensure that your event is a success. Say “I Do” all over again, with our package and venue options or celebrate a special Anniversary or Milestone with us.